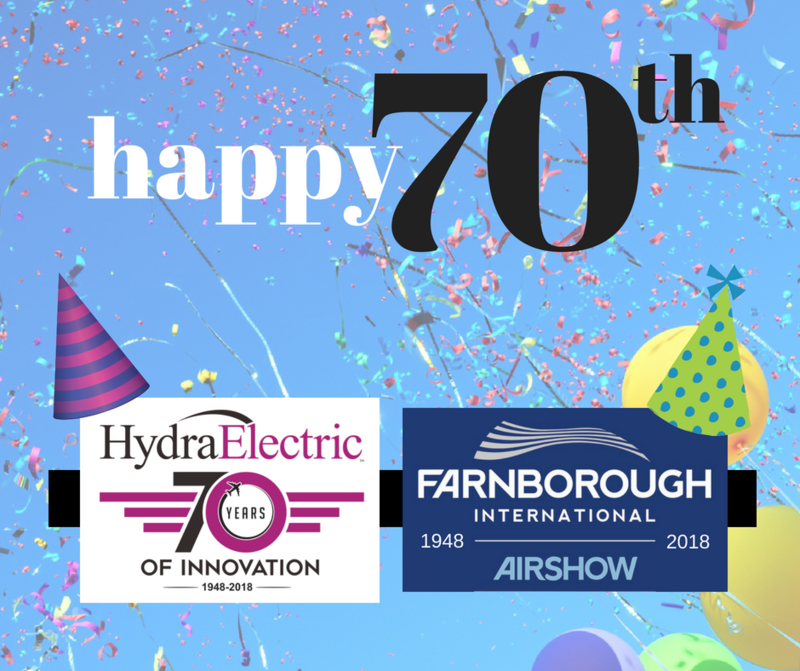 Hydra-Electric is kicking off the celebration of its 70th birthday as the Farnborough International Airshow (#FIA2018) gets underway today in London. Turns out this isn’t just a special year for us. FIA also began holding its biannual event at Farnborough Airport in 1948, the year Alan V.C. Davis founded Hydra-Electric. We’re pleased to share this significant milestone with FIA while exhibiting at #FIA18, which will run through this Friday, July 20. While we’re not sure what they have planned for their 70th, we’re announcing new products that continue the Hydra legacy of innovation. We’ve also published a new white paper that examines the hazards of high altitude radiation on aircraft electronics and presents solutions to the problem of Single Event Effects. Be sure to follow our News section and this Blog for updates on product announcements, white papers, and more. This entry was posted in #FIA2018, 70th Anniversary, Aerospace Engineering, Aerospace Events, Aerospace General Interest, Aerospace Industry, Aerospace Industry Events, Aerospace Switches, Aerospace White Papers, Aircraft Electronics, Hydra-Electric News and tagged 70th anniversary, aerospace engineering, aerospace industry, aerospace pioneer, aerospace sensors, aerospace switches, aerospace white papers, aircraft engineering, aircraft sensor design, Farnborough, Farnborough International Airshow, FIA2018, Hydra-Electric products, pressure switch. Bookmark the permalink.